Sometimes, only a brownie will do, and this is our favourite recipe for never-fail, indulgent brownies. We like pecans in our, but you can replace them with chocolate chips for an even more decadent version. 1. Preheat oven to 180C. Grease a large square baking pan and line with baking paper. Sieve cocoa and flour into a large bowl, add sugar and pecans and stir until combined. In a separate bowl, beat eggs and vanilla. Add egg mixture and cooled melted butter to flour mixture. Combine with a wooden spoon. 2. Press into prepared baking pan and bake for 25-30 minutes. 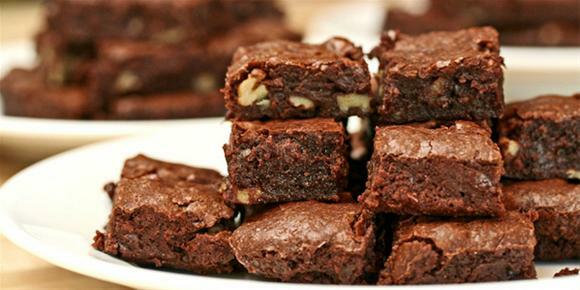 Brownies are done when the centre of cake no longer wobbles (brownies are traditionally dense and fudge like – a skewer will not come out clean). 3. Meanwhile, making the icing. Sift icing sugar into a bowl. Add cocoa, hot water, vanila essence, and melted butter. Stir well with a spoon. 4. When brownies have cooled, ice and cut into squares.